My 11 year old (great) nephew is doing a class project whereby a letter and cut-out image of him is being sent to someone who lives in a different area. That would be me. I am to write a letter back to him at his school, describing my town, and then forward his letter with his cut-out image to another person who should do the same. What a wonderful surprise to find your letter in my mailbox… and to get “cut-out Ethan” too. (He shall now be known as COE). 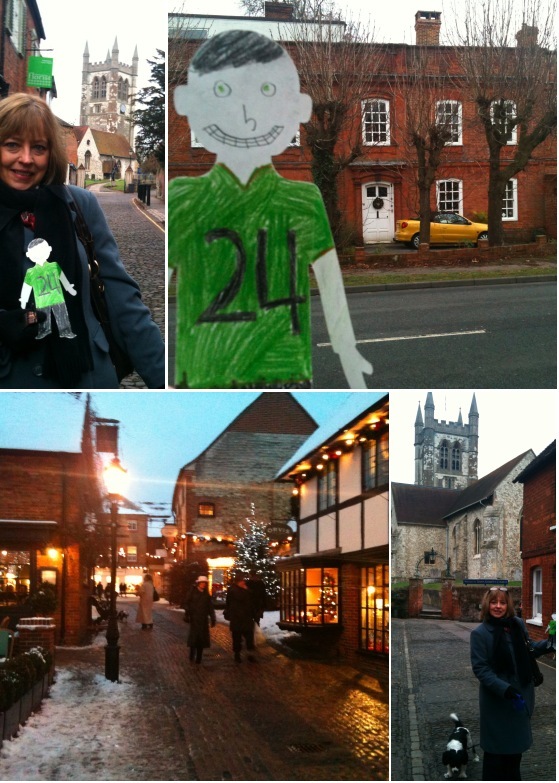 I was very happy to take COE on a tour of my new hometown, Farnham, England. As you must know, I was born in Flint, Michigan, but now live in Farnham, England with my husband, Andrew, who happens to be British. But you knew that, too, didn’t you? I live in the village of Weybourne which is a very small hamlet just two miles from Farnham town centre. I share this information with you because Weybourne has something in common with the greater Flint area as it was the home of Sir John Henry Knight, who built Britain’s first petrol powered motor car. And as a matter of fact, John Henry Knight’s house is just a few steps down the road from mine and I have even been inside that house! In fact, the first traffic offence to warrant a fine, took place in Castle Street, Farnham, on October 17th 1895. Mr. Knight and his friend, Mr. Pullinger drove his car into town and he was cited for driving without a license and also for not having a man with a red flag walk in front of his car to alert people that a car was coming. Mr Knight and Mr. Pullinger had to pay half-a-crown (which is about 20 cents). This is all true and can be verified on the internet. Andy, my husband, even wrote to the town council to see if there could be a memorial installed in Weybourne to commemorate Sir John Henry Knight. They said “good idea” but of course nothing ever happened. Farnham has a vast history which can be traced all the way back to the Stone Age. It was occupied by the Romans and later the Saxons who gave Farnham its name, “Fearnehamme”. Fearne, for the type of foliage that grew in the area, and hamme for the water meadows in the area. The Saxons lived in this area from about 688 A.D.
Farnham grew into a busy market town and has a parish church and castle that date back to the 12th century. You can visit these places today. Much of the old architecture still stands throughout the town and it is very beautiful and historic. It is located approximately 42 miles south of London. I would really like to show you Farnham and the surrounding area so please come and visit us sometime. We could have a cream tea in one of the famous “tea rooms” here and I’m absolutely certain that you would like that very much. P.S. Have you noticed how I spelled “centre” and “offence” ? You might think this is incorrect spelling but it’s actually the way those words are spelled in the United Kingdom. I could come up with a long list of words that are spelled differently but that’s for a whole other lesson, isn’t it?